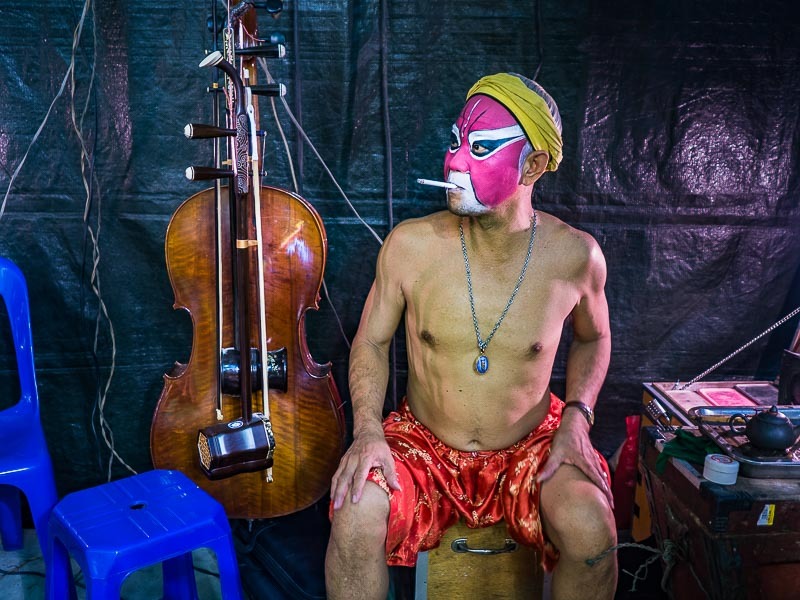 A performer at a Chinese opera smokes a cigarette backstage before a performance at the Joe Sue Kung Shrine in the Talat Noi neighborhood of Bangkok. 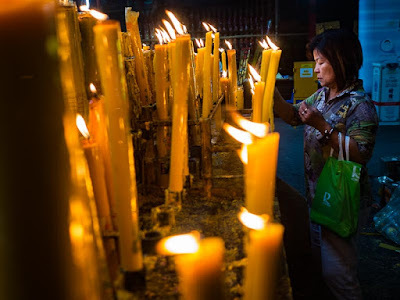 The Vegetarian Festival is lighting up Chinese communities throughout Thailand until late October. 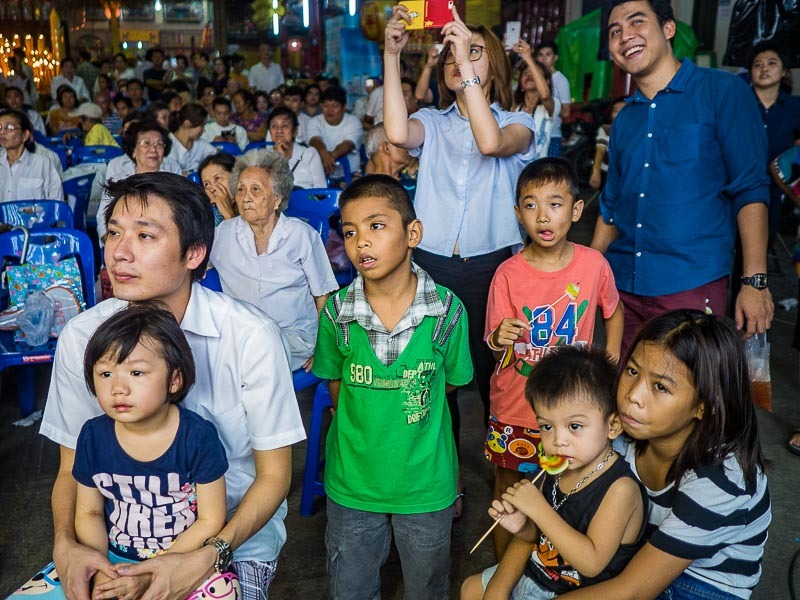 The celebration in Bangkok is not as intense as it is in Phuket but it's still a great opportunity to enjoy Thai-Chinese culture. Yaowarat Road, where I worked the first day of the Vegetarian Festival, is the commercial center of Thailand's Chinese community but the best Bangkok celebration of the festival is in Talat Noi, a sprawling warren of mechanical shops and Chinese shophouses, south of Bangkok's traditional Chinatown. A performer prays before going on stage. The Joe Sue Kung Shrine is the largest Chinese shrine in Talat Noi and hosts a terrific celebration of the Vegetarian Festival. The alleys around the shrine are packed with food vendors. The rhythmic pounding of men making a peanut confection that's a cross between peanut brittle and a cookie punctuates the air. The plaza in front of the temple is a candle lit, smoky, incense perfumed beehive of activity. Visiting Joe Sue Kung during the Vegetarian Festival is what I imagine it was like stepping back in time to China in the 19th century. A woman makes merit by lighting a candle on the plaza in front of Joe Sue Kung Shrine. There's also a large Chinese opera at the shrine during the Vegetarian Festival. 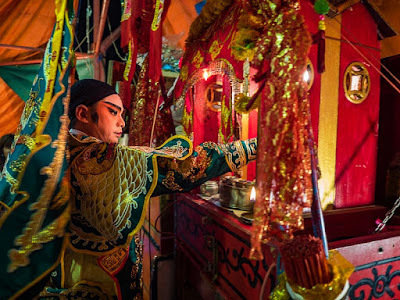 I've photographed a lot of Chinese opera in the last two years. I'm usually the only photographer at an opera. Sometimes there might be a second one, but seldom do I have to worry about a pack of photographers. Sadly, the opera at Joe Sue Kung during the Vegetarian Festival is so well known that it's become a magnet for photographers. There were more photographers at the performance Thursday night than there were cast members. There must have been 20 photographers in the dressing area backstage. Sometimes there were three or four photographers photographing the same cast member. 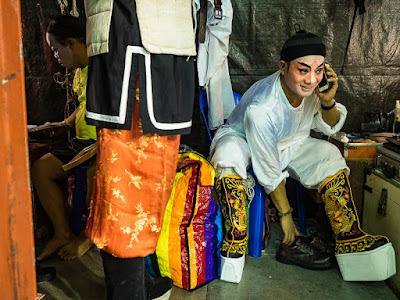 It's a testimony to Thai patience that the opera performers took it all in stride without complaint. A performer puts on his boots before the show started. I photographed performers getting into character, some of the activities around the shrine and the first hour or so of the performance and then left. It was a good opera but I don't speak Teochow (the language the opera is performed in). The show lasts about four hours and, since I don't understand what's being said on stage, the last three hours is a lot like the first hour. There is a large selection of Chinese opera photos, along with more from this year's Vegetarian Festival in my archive or available from ZUMA Press.